We are promoting the recognition and protection of Family Rights. We can’t even get support for this: “When a child is born, both biological parents have a right to know.” We’ll focus on that first. We feel we have a good plan to start a National grass-roots movement for reform. 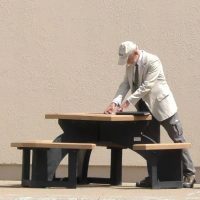 John Murtari, a former USAF Pilot is coordinating the local effort, feel free to contact him. Check here for many ways you can help, we’re recognizing all who get involved. We’ve stopped the campaign for now, to be effective we need more than just one parent willing to risk arrest. Ms. King – I really do appreciate the dismissal of the charges. I wasn’t looking forward to court proceedings and potential penalties … and also paying for a lawyer. When posting to the group I always emphasize polite/civil conduct and how courteous the officers are (and going out of their way to avoid an arrest). I’m amazed at how many parents think a good ‘protest’ involves a lot of yelling and defaming people (I guess that’s what they see on TV). I like to think our group offers them an alternative and can defuse potential violence. I think dismissing the charges helps convey the message, “the government is not out to get you!” You won’t see me there again until I’ve got another Mom and Dad with me. Easy to dismiss one person as a ‘crazy’, but three people is the start of a ‘movement’…. Sep 19th – There is no more public action planned, but now prosecution is pending for the four arrests. John made his initial scheduled appearance in the US Magistrate’s Court. An Assistant US Attorney was very polite and talked to him about the incidents and answered questions he had. She told him all the paperwork had not yet arrived for the last two arrests. 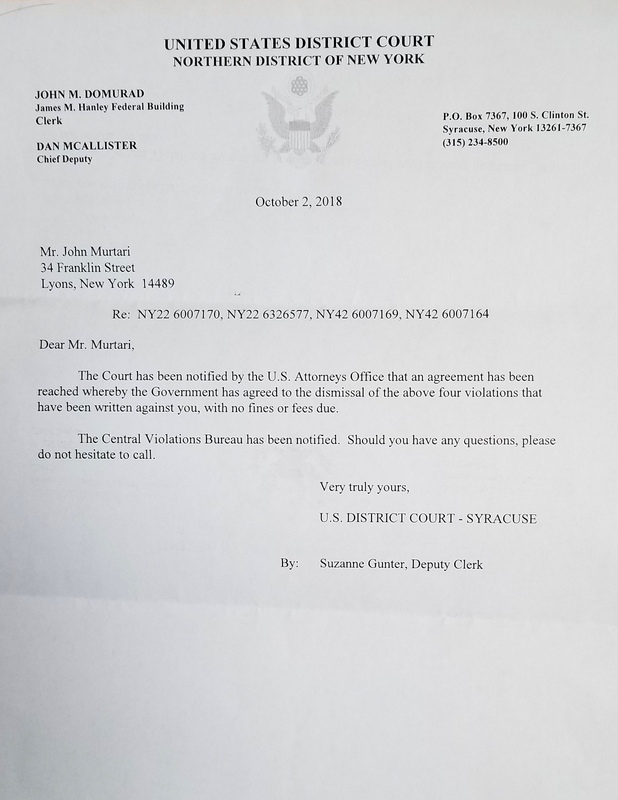 The matter was adjourned till October 17th. Click for video of arrest. 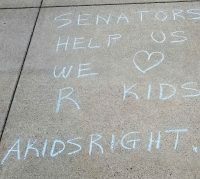 Sep 14th – Another arrest (#4), but NOT FOR CHALK. John was approached by a Homeland Security officer as he was on Sep 7th(below for details). The officer explained that a GSA Permit was required and that John could go in the building and get the permit. John declined to do that. He was told that if he did not stop his activity, he would be arrested and charged with violating the same order. John tried to explain he was involved in simple free speech activity. Holding a small placard, but walking quietly, staying out of the way, and not approaching anyone unless they spoke to him first. The officer walked away and John resumed walking around. The officer returned and again John declined to get a permit. 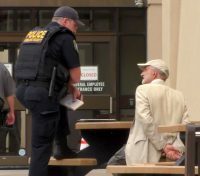 He was handcuffed and given a ticket (photo right). He was then released and did not leave, but continued similar activity for about 20 minutes. No further action was taken by security. 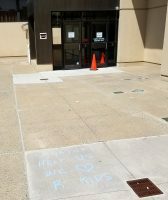 Sep 7th – Another arrest (#3), but NOT FOR CHALK. John was approached almost immediately by Homeland Security officers when walking around the Plaza. He was presented with a US District Court Order from 2002 that had sought to limit his actions. 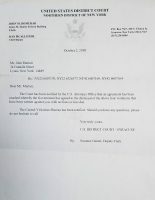 This was from previous NonViolent action to petition Senator Clinton and Schumer (click here for detailed BLOG, check data of Jan 15,2003) and told that if he did not stop his activity, he would be arrested and charged with violating the order. John tried to explain he was involved in simple free speech activity. Holding a small placard, but walking quietly, staying out of the way, and not approaching anyone unless they talked to him first. No GSA permit was required. He was handcuffed, given a ticket, and released. August 31st – More message left. John was given the courtesy of a warning to stop by building security or there could be another arrest, but no action was taken. 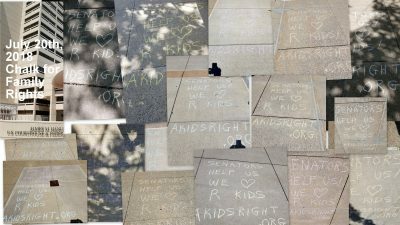 Several messages were left on the pavements. Sep 5th – Similar to August 17th (below), another arrest occurred. We have a perfect setup for media attention, just need more parents there. 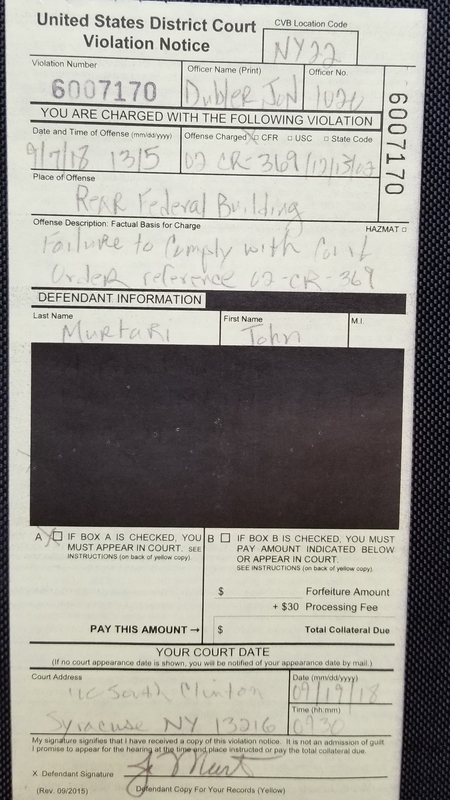 pay the fine ($50) by mail, or appear in US Magistrate Court on the 19th of September. 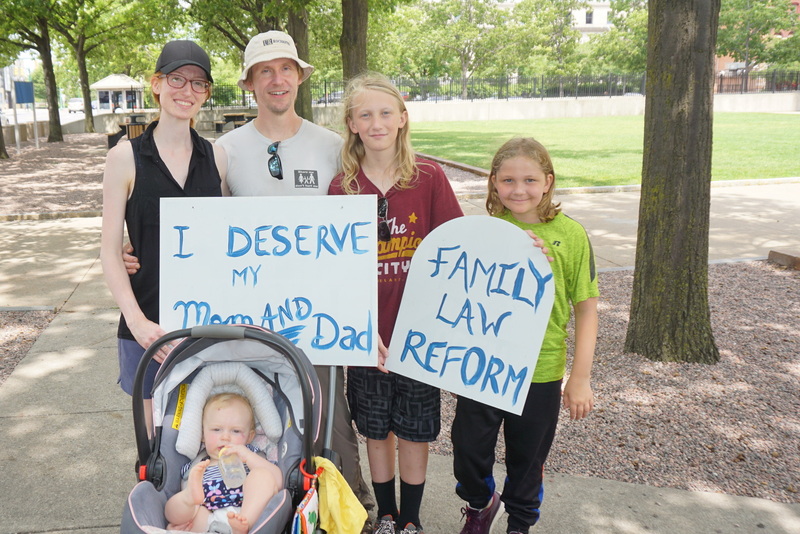 Most likely he will ask for a Trial.This is a small demonstration of NonViolent Action in support of Family Rights.We all help by making phone calls to legislators or visiting their offices in person. 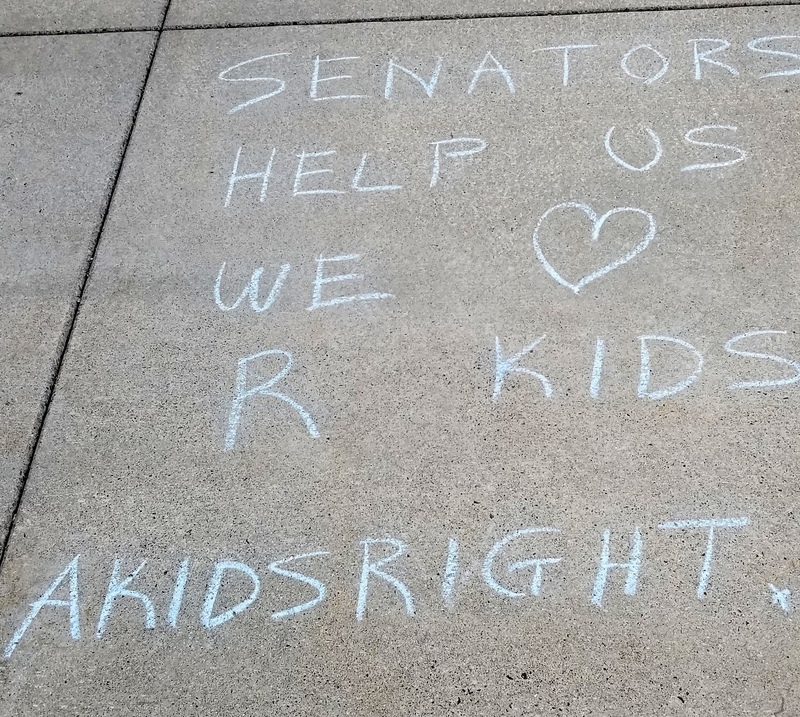 But we need a few Mom and Dads willing to take Kid’s Chalk and leave a message of love — and potentially face arrest. That would give us the News Story and Social Media impact we need to start a National discussion on Family Rights. Check this brief video for a summary of activity from June – August, includes a local TV News Report. August 9-10th, 2018 – Two days of activity. 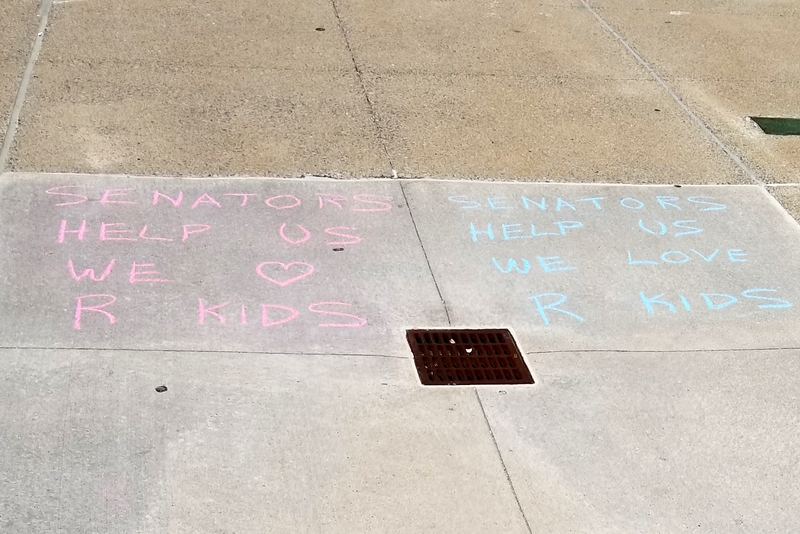 There were a lot of messages left in chalk out front (little kids thought it was neat as they left the building). 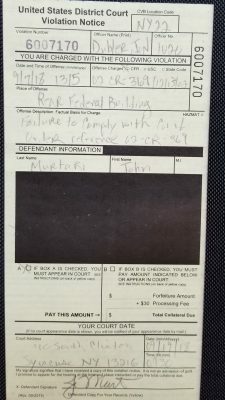 August 3rd, 2018 – Murtari forced out of the building after quietly walking the halls. 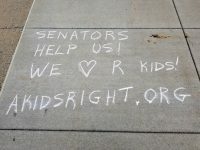 We want two powerful US Senators to respond to us, but we’re not showing a lot of public support. The method of NonViolent Action is to be peaceful. The goal is ‘good drama’ to get a click on a message and Social Media attention. We couldn’t get a dozen people outside, how about ONE person inside carrying pictures of parents/children unjustly separated? I called Schumer’s office in the morning and said I would have a letter to drop off. I got there at 1, left a few message with chalk just to see if they would react and waited till about 1:30 in case someone else might show up. I then went upstairs to Schumer’s floor (also the offices of the US Attorney for the Northern District of NY). Nobody answered their door, so I slide the letter underneath. I then took out my placard and walked around the halls. Used same photos in the building. In about 15 minutes, a couple of guys from building security showed up and told me I couldn’t do that. I said I thought I could. They asked me to follow them out, I refused. I told them it had been allowed before, they left to check….. A few minutes later one of the US Attorney’s came out, he thought I was protesting something about their office — we talked for a while and I explained. I said it was a public building and this is a simple exercise in free speech…. While we were talking about 3 more building security guys showed up…. Finally two Federal Police showed up (one knew me from years ago). They asked me one more time, made it clear they were not going to arrest me (I think they knew I wanted that). Then they took me by the arms and walked me out. So…… I don’t think they’ll be letting me in the building anymore. Once they make physical contact with me I don’t resist. Also, VERY IMPORTANT TO UNDERSTAND, I don’t ever raise my voice, or lie to them, or complain, or call them names or ask why aren’t you supporting me. The funny thing is, as much as parents rightfully complain about how bad the system is — so few are willing to join in peaceful action for reform. THEY aren’t stopping reform, WE ARE. We don’t believe our love has power and we can change the system. July 27th, 2018 – Had some parents from out of town make the trip. Mr. Jack Frost, from the Albany area, has been active in reform for many years and is currently President of FAFNY. Mr. Alex Haas came with his family from Ohio and also helps with NPO. Largest collection of messages yet – click for larger. 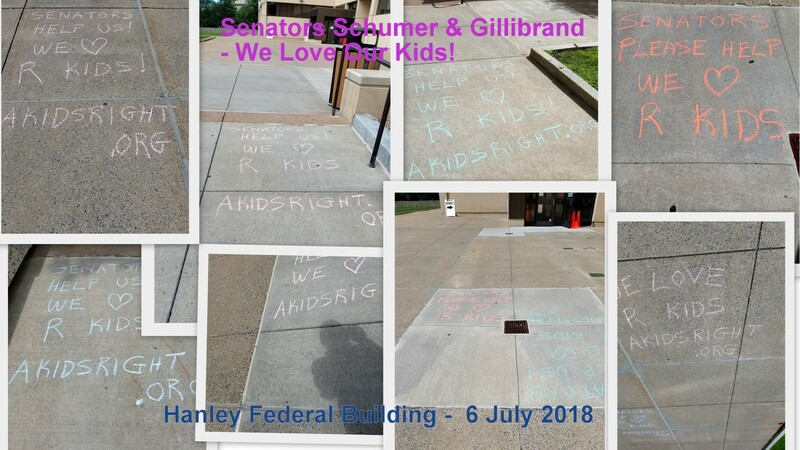 July 20th, 2018 (Friday before National Parent’s Day) – The collage doesn’t even capture all the messages that were left. July 10th, 2018 – News Coverage. A news crew for the local ABC affiliate, WIXT (Channel 9), came out to the Federal Bldg to take some pictures and do an interview. Federal Plaza. The collage below capture most of what he wrote around the building entrance. June 29th, 2018 – You know what they say — if you don’t see it on camera, it’s not real! Check out the video to see what actually goes on. Hope to see more parents next week. We’re working on making our efforts on Family Rights real. We have an experienced TV Producer (Mr. Michael Seeber from Minnesota — who in his spare time creates content for distribution on the Internet and also local News channels) and an experienced local videographer. 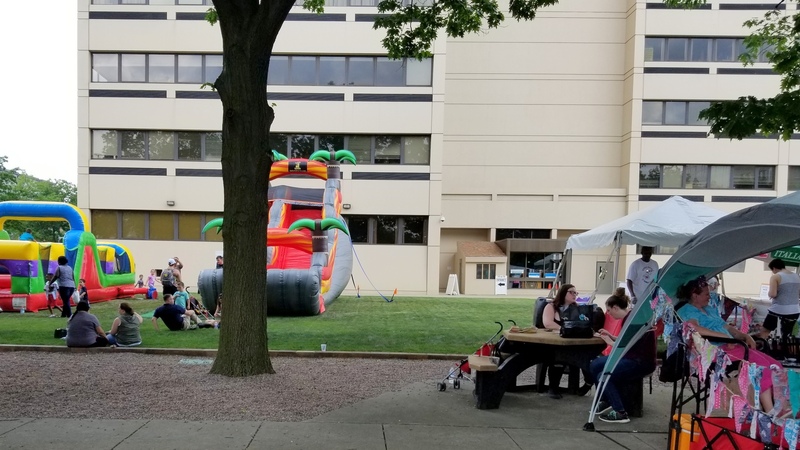 June 22nd, 2018 – No letters and no one else had time to show up. 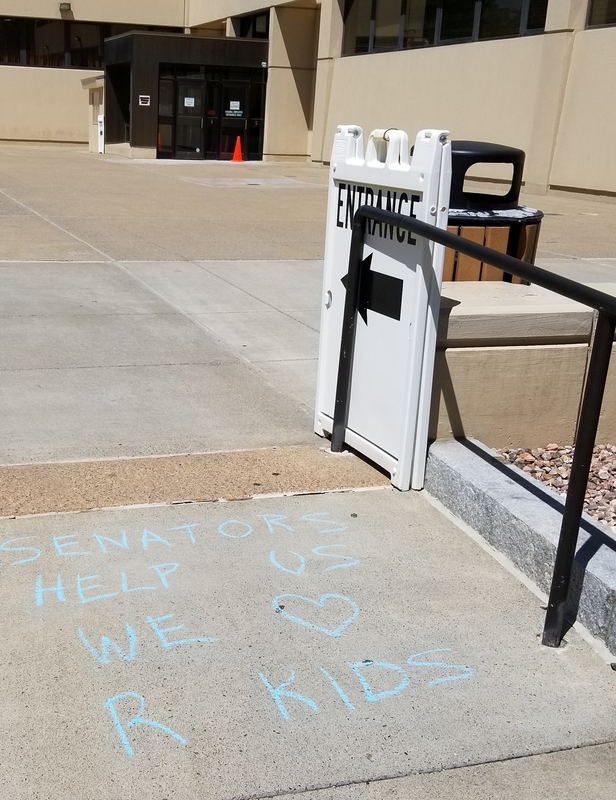 Left OUR message in about FIVE different locations around the Hanley Federal Building. 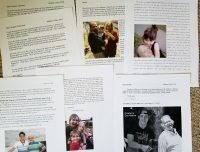 June 15th, 2018 (Friday before Father’s Day) -There were no letters to deliver, but a local Mom did show up around 1 PM to talk about some custody issues. 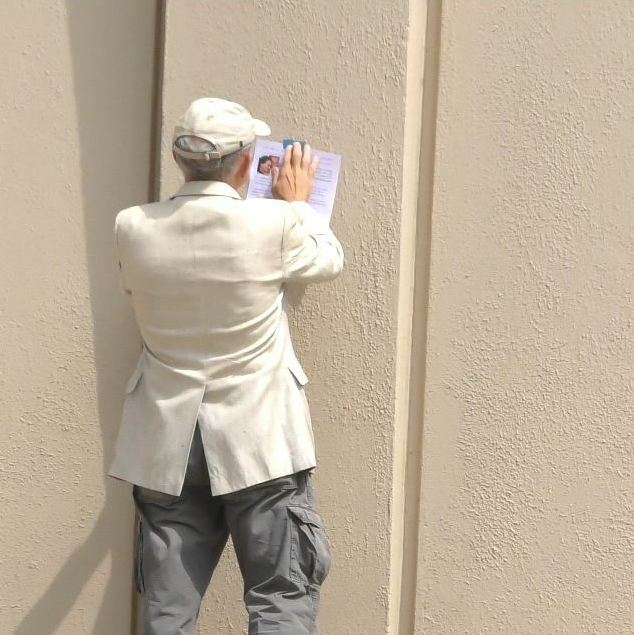 She took a pic of John and the placard he carries outside the building (His cap? He’s a USAF Academy grad & former Pilot). 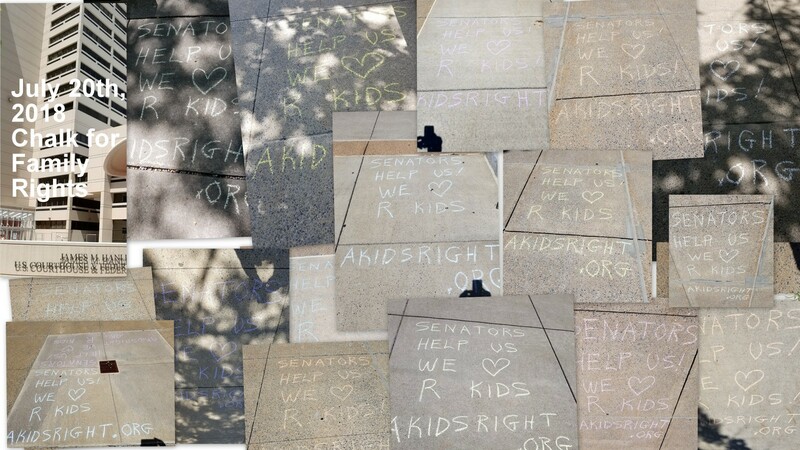 She wasn’t able to stay around and John began leaving multiple chalk messages at 2 PM. Again, security was polite, gave him another warning, but did not react to the additional messages. We need more parents as spectators and then we should be able to get some local media coverage. Read a ‘frank’ list message: Not-So-Happy Father’s Day – when does it end? 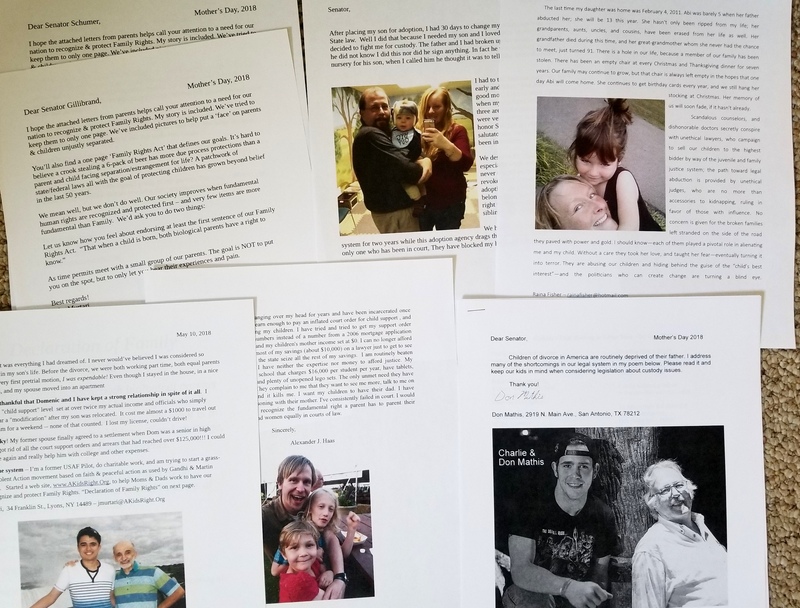 June 1st, 2018 – Another Mom showed up with a photo and letter. We delivered it and spoke briefly with the Regional Director for Senator Schumer. 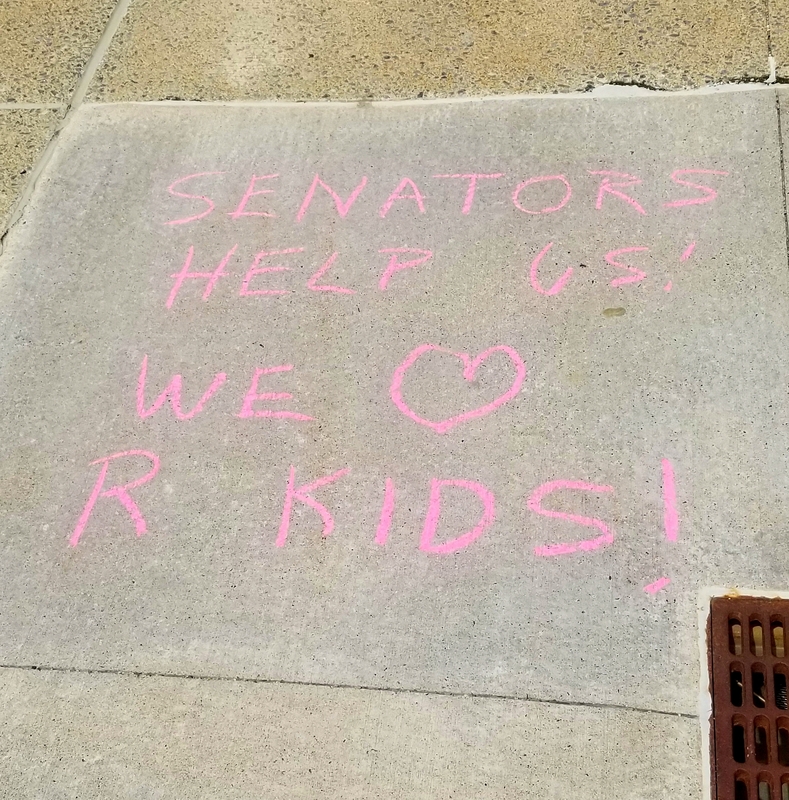 The original plan had been to leave a chalked message and risk a potential arrest; how ever, a lot of downtown Syracuse was blocked off to traffic. It was the “Taste of Syracuse” festival and there were a lot of people around and also on the Federal Plaza. John has a ‘working’ relationship with security, and tries to avoid incidents when they are busy. It hadn’t rained in a week, the message from the 25th was still clearly visible! May 25th, 2018 – No letters to deliver. 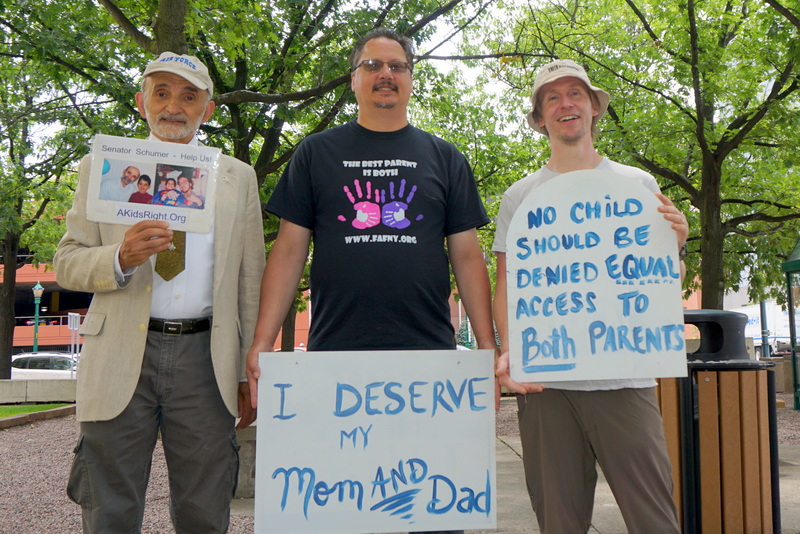 John carried a small placard with pictures of parents and children unjustly separated. His cap? He is a former Air Force pilot. He then left a message in chalk and was then warned by building security to not do that anymore or they’d have to take action. 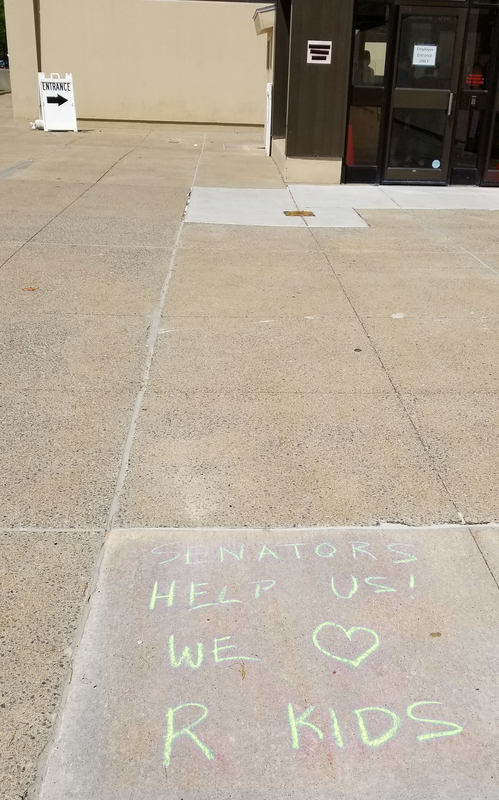 We’ve left two weeks worth of letters at the local offices of the Senators. John tried to call their local aids to get some type of response. Had to leave a message and no callback so far. 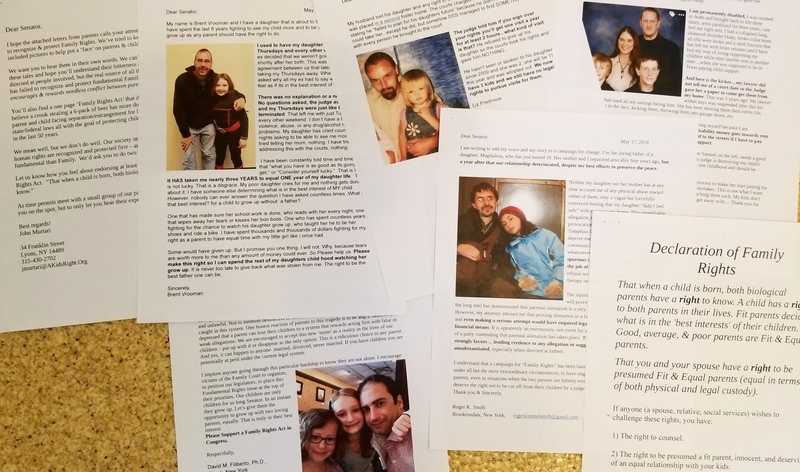 May 18th, 2018 – A package of 5 more of your letters was delivered. 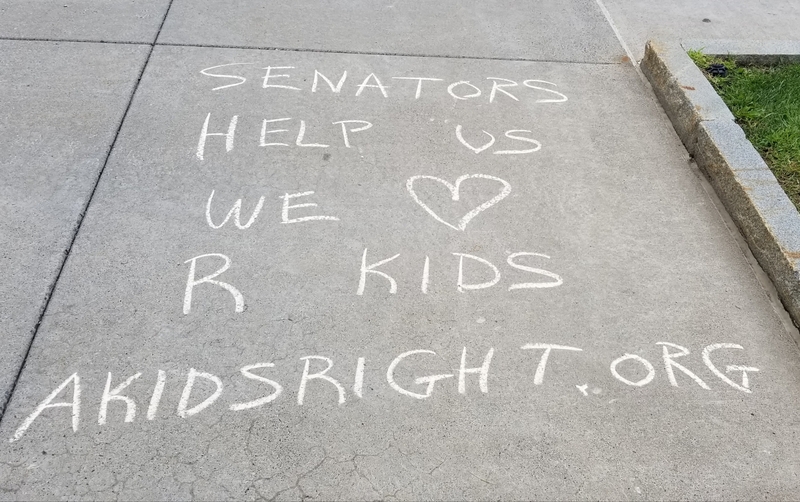 Delivered the letters and left a chalked message on the pavement. Read a recent list message for more details. 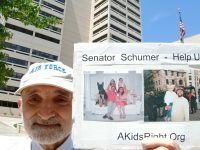 May 11th, 2018 (Friday before Mother’s Day) – A package of five letters was dropped off at the offices of Senators Schumer and Gillibrand. Got to the Syracuse Federal Bldg at about 12:30, just walked around outside carrying a small placard with pics of parents and children. 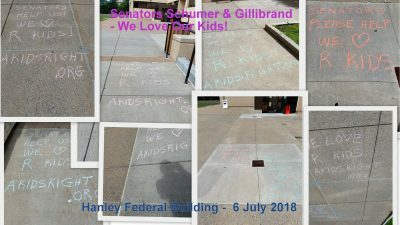 At about 1:15 I quit waiting for anyone to show up, and brought the letters/photos you had submitted to the local offices of Senators Schumer & Gillibrand. Well within view of the entrance, not to mention extensive surveillance cameras. It appears nobody noticed. Stayed around for another 15 minutes and the left. Visit the local offices of US Senators Schumer and Gillibrand. Leave a personal letter letting them know you care about Family Rights. Walk quietly carrying a picture of your/other kids unjustly separated. 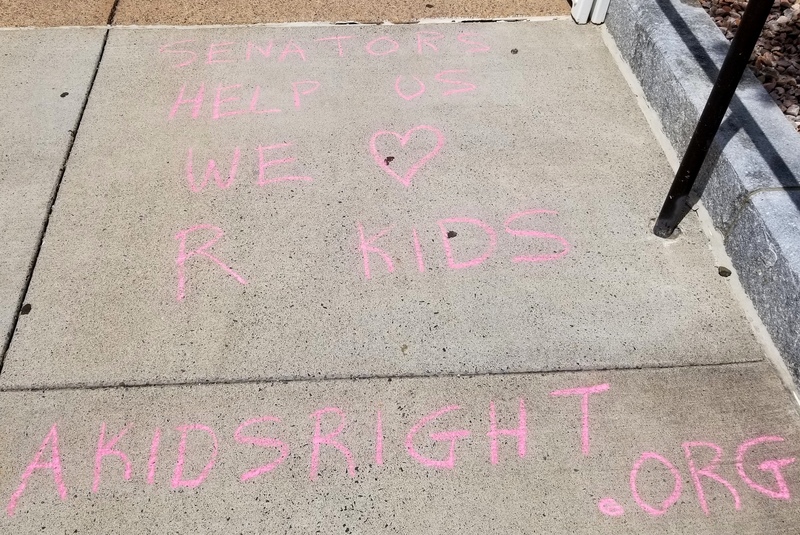 Bring some Kid’s Chalk and leave a message of love on the pavement. If we can get a good turnout we may be able to arrange some media attention. 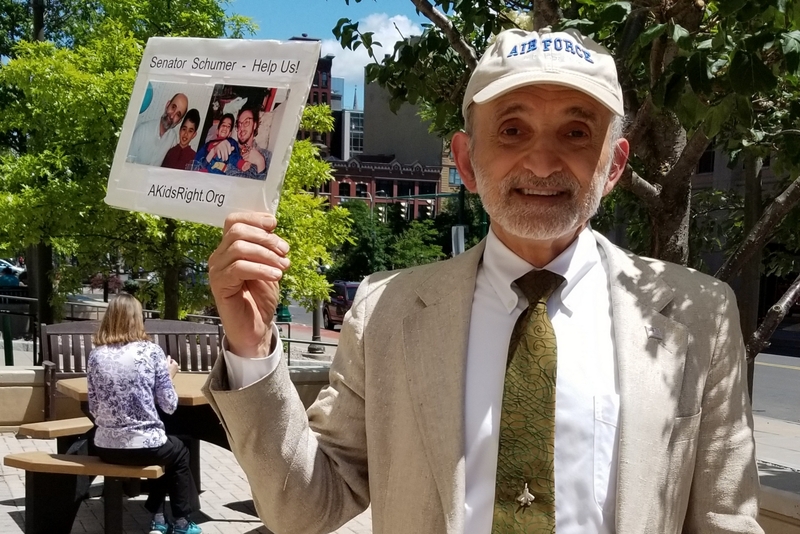 June 2017 – Visited with aides for Senator Schumer & Gillibrand at the Syracuse Federal Building. . Talked to them about the need to recognize & protect Family Rights. Left them a package including photos & letters from parents. 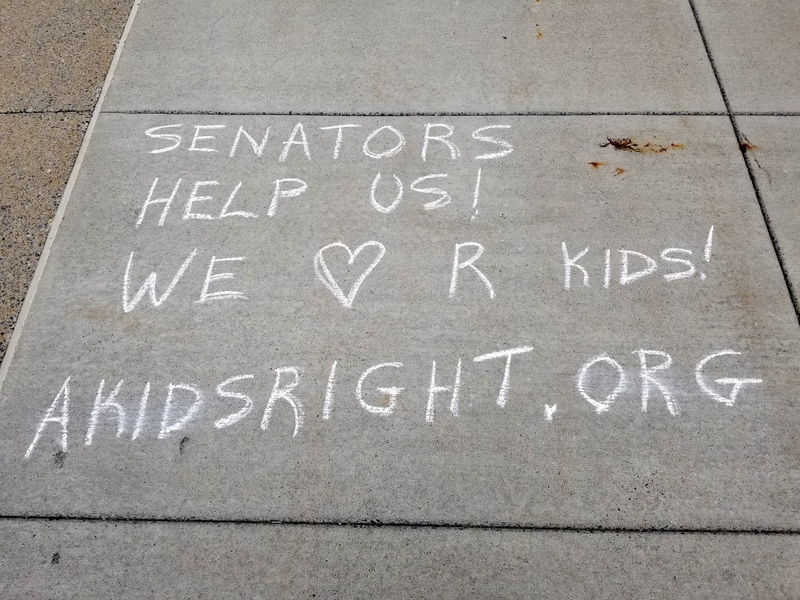 Couldn’t even get political support for → “When a child is born, both biological parents have a right to know.” Senator Gillibrand’s aide thought I had a point and something to consider. Senator Schumer’s aide felt it was the mother’s decision to let a father know he had a child. Check here for efforts in 2013-2014.